Mankind first transmitted a dedicated radio message to the stars at 5pm on 16th November 1974 from a radio telescope situated in Arecibo in Puerto Rico (left), although other radio and television transmissions had been drifting into space for decades; the inadvertent result of normal terrestrial broadcasting. 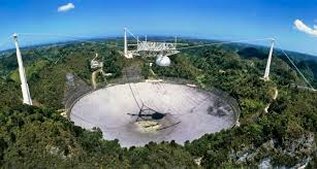 The message sent was a three-minute signal targeted towards a group of stars 24,000 light years away and was primarily intended to be a demonstration that terrestrial radio astronomy had reached a level that would allow interstellar radio communication over vast distances. Actually, the formula doesn’t give an answer as such, for any number generated can only be based on the numbers attributed to each part of the formula. That said, essentially it works like this: Drake (right) determined that N signifies the number of civilisations in our galaxy attempting to make contact. R stands for the average rate of star formulation and based on observations from the Hubble telescope this is generally accepted to be around ten stars each year. Fp is the fraction of stars that could contain planetary systems and whilst this is much debate about this, a figure of one in ten is not unreasonable. Next Ne signifies the number of these planets that are Earth-like. Based on our own solar system, this could be determined as 1. F1 stands for the fraction of these Earth-like planets on which life could develop. This is fairly straightforward, either life develops or it doesn’t therefore F1 is either 1 or 0. If 0, then the overall formula will always generate a figure of zero as well. We will accept the view expressed by Professor Jesco Puttkamer, former Senior Staff Scientist of Advanced Programmes of Space Flight, NASA, who, when asked "Could you give me a clear mathematical probability of the existence of life in outer space?" replied "One … one is certainty." (1) We also now not only believe their might have been life on Mars, but the moons of Jupiter are also being suggested as probable homes for possible micro-organisms) so F1 will be 1. Using these figures, the formula calculates that N, (the number of advanced civilisations wanting to make contact) is 10 x 0.1 x 1 x 1 x 0.1 x 5000. This suggests that there are 500 civilisations in this galaxy alone (one galaxy in a universe of 100 billion) who may be trying to contact us. Having calculated the number of races that might be trying to contact us, the next question is, how could they space travel to reach us? Albert Einstein advises us that nothing can travel faster than the speed of light (E=MC2) and late twentieth century space missions to the nine known planets of the Solar System have revealed no signs of intelligent life there. Therefore, any one visiting us must be travelling from outside the Solar System, yet the distances involved suggest that such travel is not achievable. Project Icarus was founded as a non-profit organisation to realise interstellar space travel before the year 2100. Former astronaut Mae Jemison leads the organisation and stated "Yes, it can be done. Our current technology arc is sufficient." Those who believe it will not be possible need to look back a hundred years and realise that inventions and discoveries beyond our comprehension did not exist then and just as authors such as Jules Verne wrote novels about the impossible, many of those fictional ideas have become a reality. Continues ... Light travels at 186,000 miles a second, meaning that light could travel round the planet Earth seven times in one second. It takes 2.5 seconds for light to go to the Moon and back, and eight and a half minutes to travel from the Sun to Earth. It takes light five hours to travel from the Sun to the furthest planet Pluto and to the nearest star 4.3 years. Thereafter, the time periods appear to preclude the possibility of space travel, taking 30,000 years for light to reach the centre of our galaxy; 100,000 years to cross the galaxy, and to reach our nearest galaxy, Andromeda (right) light takes 2.2 million years.